In various ways, the life of right-handed pitcher George Pechiney typified the existence of the late-nineteenth-century journeyman player. Pechiney’s abilities were modest, and his major-league career was a relatively brief one, abbreviated by abuse of alcohol. Once his playing days were over, Pechiney returned to the arduous everyday working life from which he had sprung, his name rarely appearing in newsprint from then on. He seldom ventured far from home, married a local girl and raised a family, lived quietly, toiled into his senior years, and died within walking distance of the place where he had been born. In sum, the life of George Pechiney, like that of many of his contemporaries in uniform, was almost entirely unremarkable – but for the singular distinction of having been a major-league ballplayer. George Adolphe Pechiney (pronounced PEESH-en-ney)1 was born on September 20, 1861, in Cumminsville, Ohio, a village located on the northern edge of Cincinnati that was incorporated into the city a dozen years later.2 He was one of seven children born to Peter F. Pechiney (1833-1880), an Ohio native and Union Army veteran of French-Catholic stock employed as a printer, and his wife, Mary Jane (née Gardner, 1835-1903), an emigrant from England.3 George attended school through the eighth grade and then entered the work force. The circumstances under which he matured were far from genteel. “Before it was annexed by the Queen City,” a local history recites, “Cumminsville had a reputation for rowdyism. Dubbed ‘Helltown’ by Cincinnatians, it was known for its barrel houses and honky-tonks where brawls, feuds, rioting and drunken revelry defied the small village police force.”4 Happily for our subject, Cumminsville was also a hotbed of early baseball, spawning major-league pitchers Dory Dean, Bob Gilks, Billy Crowell, and Wild Bill Widner, in addition to George Pechiney. By the time of the 1880 US Census, George was employed in a Cincinnati carriage-making plant where strenuous daily labor produced the brawny 5-foot-9, 184-pound frame of his ballplaying prime.5 He and his brothers Charlie and Bill devoted their spare time to baseball, becoming mainstays for the Cumminsville Blues, Millercreek Bottoms, and other local amateur nines. A capable right-handed hitter and a versatile defender as well as being able to pitch, George played all over the diamond. In 1885 he entered the professional ranks, signing as a position player with the Columbus (Georgia) Stars of the Southern League. After batting .261 in 12 contests and losing his only pitching assignment, Pechiney was let go. A one-game tryout with a league rival, the Chattanooga Lookouts, was also unsuccessful, reportedly terminated after Pechiney dropped a fly ball.6 By summer, George was back home, playing for the semipro Cincinnati Clippers. Four days later, “the home experiment Pechiney again proved a hard man to hit,”10 setting down the Louisville Colonels on five hits, winning 10-2. With Mullane sidelined and veteran Will White in disfavor, Pechiney assumed a spot in the Cincinnati rotation, alternating starts with 20-game winner Larry McKeon. On September 15 Pechiney added to his growing reputation, hurling a 1-0 victory over Baltimore. On other occasions, however, a tendency toward wildness put Pechiney in the losing pitcher’s column. But in all, the not-yet-24-year-old got off to a promising beginning, posting a 7-4 mark, with a fine 2.02 ERA in 98 innings pitched for the second-place (63-49) Reds. At season’s end, he was promptly reserved by Cincinnati for the 1886 season,11 and was expected to join the returning Mullane and holdover McKeon as a key member of a formidable Reds pitching staff. At age 26, George Pechiney’s brief major-league career was now behind him. In parts of three seasons, he had posted a 23-34 (.404) record, with a high 4.23 ERA over 514⅓ innings pitched. As was the case with many marginal nineteenth-century pitchers, control had been a problem. The Pechiney walks/HBP/wild pitches total (272) far exceeded his strikeouts (183), and opposition batters hit a solid .284 against him. On the plus side, he had turned in a solid freshman half-year in the box, and had occasionally helped his own cause with the bat, posting a respectable-for-a-pitcher .205 career batting average, with 10 extra-base-hits and 24 RBIs in 62 games played. 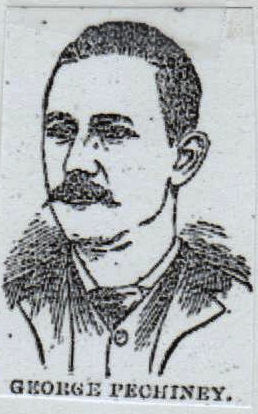 Pechiney had also served as a four-game outfield fill-in for the Reds during the 1886 season. George Pechiney led a long but quiet post-baseball life. In May 1890 Cincinnati sportswriter Ren Mulford Jr. (a fellow Cumminsville native who kept tabs on the players from his boyhood haunts) reported that George, never exactly trim to begin with, had grown “as big as an alderman.”35 By the late 1890s, Pechiney had landed a softer job as a plant timekeeper.36 Meanwhile, George had also effected a change in his domestic situation, marrying Cincinnatian Laura Belle Wright in April 1894. The birth of daughters Doris (1897) and Irma (1902) made the family complete. As he entered old age, George developed heart disease. His death, however, was caused by a stroke, suffered at his residence on July 14, 1943.42 He was 81. Following funeral services, his remains were interred at Spring Grove Cemetery in Cincinnati. Survivors included his widow, Laura, and daughters, Doris Pechiney Geldreich and Irma Pechiney Becker. Sources for the biographical info contained herein include the George Pechiney file maintained at the Giamatti Research Center, National Baseball Hall of Fame and Museum, Cooperstown, New York; US Census reports, Cincinnati city directories, and Pechiney family posts accessed via Ancestry.com; and certain of the newspaper articles cited below. Also consulted was the George Pechiney entry in Major League Profiles: 1871-1900, Vol. 1, David Nemec, ed. (Lincoln: University Of Nebraska Press, 2011). Unless otherwise noted, stats have been taken from Baseball-Reference. 1 The Baseball-Reference entry for George Pechiney lists a nickname of Pisch, a moniker specified in the posthumous player questionnaire submitted to the Hall of Fame library by his son-in-law Harry Geldreich in June 1973. But research by the writer failed to uncover even a single instance wherein this purported nickname appeared in newsprint. It will, therefore, not be used in this bio. 2 Cumminsville was annexed by the City of Cincinnati in 1873. After decades of decline, the Cumminsville area became trendy in the 1970s and is now known as Northside. 3 George’s siblings were Bertha (born 1856), Charles (1857), Robert (1859), William (1867), Katherine (1869), and Jennie (1871). 4 Cincinnati: A Guide to the Queen City and Its Neighbors, compiled by the Writers Program of the WPA (Cincinnati: The Wiesen-Hart Press, 1943), 31. 5 Pechiney’s offseason occupation as a carriage-maker was periodically noted on the sports page. See, e.g., Sporting Life, July 21, 1886, and April 27, 1887. But the Cincinnati city directories of the time invariably listed Pechiney as a blacksmith. 6 According to the Boston Herald, September 15, 1885. 7 The Cincinnati Post, August 5, 1886, maintained that Pechiney was “a ‘bud’ of Tony Mullane,” and that the idled ace had tutored Pechiney on the fine points of pitching. Another Cincinnati newspaper later described Pechiney as “Mullane’s prodigy and discovery.” See the Cincinnati Commercial-Tribune, February 14, 1886. 9 See “Pechiney’s Picnic: Pittsburgh Sluggers ‘Done Up’ by an Amateur,” unidentified August 5, 1885, news article contained in the Pechiney file at the Giamatti Research Center. 10 Sporting Life, August 19, 1885. 11 As reported in Sporting Life, October 22, 1885. 12 As reported in the Sporting Life, October 28, 1885, and the Boston Herald, October 29, 1885. 13 As per Sporting Life, February 10, 1886. 14 Sporting Life, July 21, 1886. 15 See, e.g., Nemec, 148. 16 The Cincinnati Star-Times, reprinted in the Wheeling (West Virginia) Register, January 10, 1888. 17 As per Sporting Life, October 13, 1886. 18 As reported in the Boston Herald, New York Times, and Trenton Evening Times, December 17, 1886. 19 Cleveland Plain Dealer, April 17, 1887. 20 Cleveland Plain Dealer, May 11, 1887. 21 The five walks that Pechiney surrendered were also recorded as base hits under the peculiar, one-year-only scoring rules of the 1887 season. Even so, Pechiney yielded fewer base hits that day than any other pitcher in either the National League or American Association, according to the Cleveland Leader, May 11, 1887. 22 As reported in the Cleveland Plain Dealer, July 3, 1887. 23 Cleveland Plain Dealer, July 2, 1887. 24 As reported in the Cincinnati Commercial-Tribune, July 29, 1887, and Cleveland Plain Dealer, August 2, 1887. The disposition of subsequent proceedings against Pechiney in Cincinnati Police Court is unknown. 25 As noted in Sporting Life, September 7, 1887. 26 As reported in the Cleveland Plain Dealer, January 2, 1888, and Cleveland Leader, January 3, 1888. 27 As per Sporting Life, May 22, 1888. 28 Sporting Life, May 6, 1888, referencing future Hall of Fame slugger Sam Thompson. 29 The 2-9 record is a guesstimate based on the writer’s review of line/box scores published in the Canton (Ohio) Repository. Baseball-Reference provides no pitching stats for Pechiney’s stay in Canton. 30 Canton Repository, June 20, 1888. 31 As reported in the Canton Repository, June 28, 1888. 32 Canton Repository, July 2, 1888. 33 As reported in the Cleveland Plain Dealer, July 26, 1888. Pechiney’s final .284 batting average finished second to that of first baseman Jake Virtue among the Nadjys. See the Cleveland Leader, October 2, 1888. 34 As reported in Sporting Life, May 16 and 29, 1889. 35 Sporting Life, May 17, 1890. 36 As per the Canton Repository, April 6, 1897. In May 1889, Charlie Pechiney had been elected national rep for the carriage-makers local (District 47, Cincinnati) of the Knights of Labor, but whether his influence landed George the cushier plant job is unknown..
37 See the Cincinnati Post, January 23, 1905. The brief note did not identify which of his three brothers George was going into business with. 38 The posthumous player questionnaire completed by Harry Geldreich gave Pechiney’s post-baseball occupations as carriage company superintendent and tool maker. 39 St. Patrick’s Branch No. 88, Catholic Knights of Ohio, as per the Cincinnati Post, January 3, 1916. 40 As per the Cincinnati Post, July 6, 1918. 41 Lee Allen, The Cincinnati Reds: An Informal History (New York: G.P. Putnam’s Sons, 1948), 31. 42 Pechiney’s death certificate posits the cause of death as cerebral hemorrhage, with arteriosclerotic heart disease listed as a contributing factor.